Synthetic peptide: VLRDYLSSFPFQI, corresponding to C terminal amino acids 199-211 of Human SOCS1 . Mouse Spleen Lysate; Mouse and rabbit muscle whole tissue lysate. Our Abpromise guarantee covers the use of ab9870 in the following tested applications. IHC-P Use a concentration of 2 - 3 µg/ml. Perform heat mediated antigen retrieval with citrate buffer pH 6 before commencing with IHC staining protocol. WB Use a concentration of 1 - 3 µg/ml. 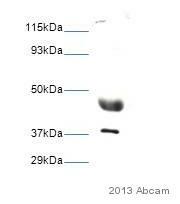 Detects a band of approximately 30-35 kDa.Can be blocked with Human SOCS1 peptide (ab23167). SOCS family proteins form part of a classical negative feedback system that regulates cytokine signal transduction. SOCS1 is involved in negative regulation of cytokines that signal through the JAK/STAT3 pathway. Through binding to JAKs, inhibits their kinase activity. In vitro, also suppresses Tec protein-tyrosine activity. Appears to be a major regulator of signaling by interleukin 6 (IL6) and leukemia inhibitory factor (LIF). Regulates interferon-gamma mediated sensory neuron survival (By similarity). Probable substrate recognition component of an ECS (Elongin BC-CUL2/5-SOCS-box protein) E3 ubiquitin ligase complex which mediates the ubiquitination and subsequent proteasomal degradation of target proteins. Seems to recognize JAK2. Expressed in all tissues with high expression in spleen, small intestine and peripheral blood leukocytes. The ESS and SH2 domains are required for JAK phosphotyrosine binding. Further interaction with the KIR domain is necessary for signal and kinase inhibition. The SOCS box domain mediates the interaction with the Elongin BC complex, an adapter module in different E3 ubiquitin ligase complexes. The Elongin BC complex binding domain is also known as BC-box with the consensus [APST]-L-x(3)-C-x(3)-[AILV] and is part of the SOCS box. ab9870 (2.5µg/ml) staining of paraffin embedded Human Kidney. Steamed antigen retrieval with citrate buffer pH 6, AP-staining. Flow cytometric analysis of HEK293 cells with ab9870 (blue line), permeabilized with 0.5% Triton. Primary incubation 1hr (10ug/ml) followed by Alexa Fluor 488 secondary antibody (1ug/ml). 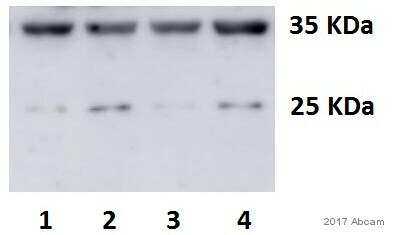 IgG control: Unimmunized goat IgG (black line) followed by Alexa Fluor 488 secondary antibody. HEK293 overexpressing SOCS1 and probed with ab9870 (mock transfection in lane B). 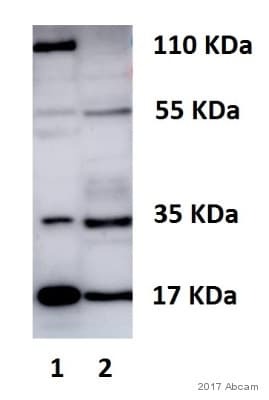 Western blot - Anti-SOCS1 antibody (ab9870)This image is courtesy of and Abreview from Sandra Perez. Lysates/proteins at 45 µg per lane. Publishing research using ab9870? Please let us know so that we can cite the reference in this datasheet. To our knowledge, customised protocols are not required for this product, any general Flow Cytometry protocol could be used with this antibody. The optimal dilutions should be determined by end user.I wouldsuggest starting anywhere from1ug-10ug/ml. All of these antibodies are tested with human samples and in IHC-P e.g. ab62584, ab9870, ab135718, ab83493, ab65989 so these would work. Choose any one of these for best results. Please note,because you are using mouse for tissue grafts so avoiding mouse monoclonal would be a good idea else we can suggest some extra blocking steps. The concentration of antibody for IHC-P can be tried somewhere between 1-10ug/ml. Please could you tell me what differences are between these two antibodies: SOCS1 antibody (ab9870) and SOCS1 antibody (ab3691)? Which one is better to use in lysates made of human melanoma cells? Do I have to use as a secondary antibody a goat polyclonal in case of Ab9870? I need your advice to choose the best antibodies against STAT2 and SOCS2 proteins. In case of STAT2, I need to detect both phosphoforms of STAT2 (anti-phosphoSerine and anti-phosphoTyrosine specific STAT2 antibodies) as well as a whole anti-STAT2 antibody as a loading control after membranes reblot with phospho-specific STAT2 antibodies. Thank you very much in advance. Thank you for your enquiry. The differences between goat polyclonal to SOCS1 (ab9870) and rabbit polyclonal to SOCS1 (ab3691) is that ab9870 reacts with mouse and is predicted to react with human due to sequence homology. So far it has only been shown to work by western blotting. ab3691 reacts with human and has been shown to work by western blotting, immunoprecipitation and ELISA. We do not have details as to the best one of the two for application to human melanoma cells. 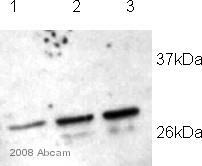 Yes, you will need an anti-goat IgG secondary antibody for use with SOCS1 antibody (ab9870). For a detailed list of compatible secondaries may I suggest that you visit the datasheet of the antibody and scroll to the bottom. Unfortunately we do not sell any antibodies that are specific for the phosphorylation status of STAT2. I hope this information helps, please do not hesitate to contact us if you need any more advice or information. It states that ab5923 detects a band of 47kD in WB when the predicted MW of SOCS1 is 24 kDa. Ab3691, also a SOCS 1 antibody, detects a band at 24 kDa - why? I still have not heard a response to the enquiry reference CRM372981 and it has been a week. This has slowed down my research and questioned everything completed thus far because it is not certain whether the antibody (ab5923) actually recognizes SOCS-1. I would like to try another SOCS-1 antibody , however, I am hesitant because I am not pleased with ab5923 and I would like to know that the antibody I am interested in, ab9870, definitely recognizes SOCS-1. Please let me know if you have any information. Thank you for your patience. As ab5923 was originated outside Abcam I had to contact the originator regarding your question and have just heard back. There was a mistake on the datasheet for ab5923 - it is a CIS1 antibody, not a SOCS1 antibody. I apologize for this mistake and the datasheet will be updated to reflect this information. I can of course offer you a refund or an alternative antibody free of charge. Ab9870 is a SOCS1 antibody, as well as ab3691. Please let me know what you would like. Customer is having problems with these two antibodies in WB. Secondary is working fine in other blots. Using mouse lysate. For both, has tried dilutions at 1:500, 1:1000, 1:2000. Is getting extremely high background. ab9870: lot#11815 Is seeing lots of bands of equal intensity to the expected band at approx. 30 kDa. ab3693: lot#30036 In the region of interest (27 kDa) is seeing 3 bands and other background bands of equal intensity to those. I'm sorry to hear that you are having problems with these two antibodies. I am enquiring with the originators of these two antibodies for suggestions that will help you out. In the meantime, below is a general protocol for ab9870 that will be helpful for you. Some suggestions: high background is usually a sign of a blocking problem. I know that you mentioned that you have tried different blocks, but the secondary may be reacting with the blocking reagent. I suggest that you test this by omiting the primary antibody and testing with only the secondary. If background appears, change either the secondary or the blocking reagent. Also, please try using the secondary at a lower concnetration. Protocol for ab9870: After transfer on PVDF membrane, membrane is blocked in 2.5% skimmed milk in TBS-T for 1 hr at room temperature with agitation (can be blocked overnight at 4C without agitation). We find enhancement of transfer of proteins on PVDF membranes compared to nitrocellulose membranes. Primary antibody (~2ug/ml) was incubated for 1 hr at room temperature with agitation. Then membrane was incubated with the secondary antibody for 1 hr at room temperature with agitation. Washing with TBST three times after primary and secondary antibody, each wash is about for 5-10 mins. We use ECL-plus (Amersham) rather than ECL, which is more sensitive for detection.